In recognition of the growing problem of antibiotic resistance, professional organizations of health care practitioners have developed guidelines regarding the appropriate use of antibiotics. It has been found that dentists prescribe between 7% and 11% of all common antibiotics. The American Academy of Pediatric Dentistry (AAPD) has published guidelines for antibiotic use, recognizing the increasing prevalence of antibiotic-resistant microorganisms. The guidelines are intended to provide guidance for the proper and judicious use of antibiotic therapy in the treatment of oral conditions in children. Pediatric patients require special dosing that is adjusted for their body weight. A number of formulas have been used throughout the years to determine the best dose for pediatric patients but the most commonly used method is stated as mg/kg of body weight. Exploration of scientific literature has revealed a scarcity of literature with overprescription of antibiotics in the pediatric population, which provided an impetus to conduct this survey, the objective of which was to compare the antibiotic prescription pattern (based on AAPD guidelines) and the awareness of antibiotic resistance between Bachelor of Dental Surgery (BDS) practitioners and pediatric dentists. This study was a cross-sectional survey. 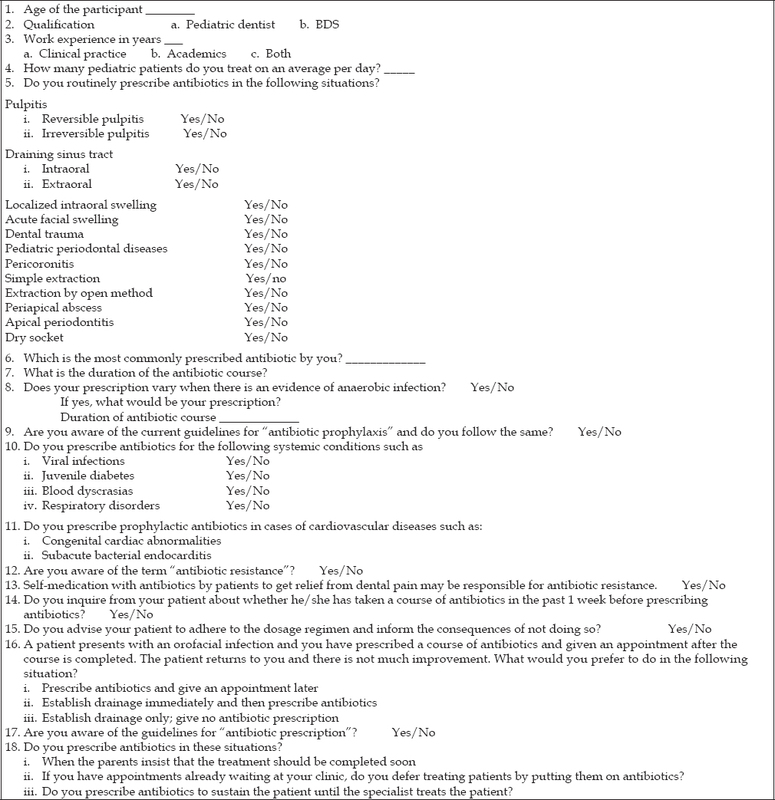 A validated, self-designed questionnaire [Table 1] was prepared to collect demographic data and information regarding the prescription pattern of antibiotics among dentists. The questionnaire contained both open-ended and close-ended questions. A hundred BDS practitioners and 100 pediatric dentists were included in the survey. A written informed consent was obtained from all the participants. The questionnaire comprised information pertaining to the following: Demographic details, qualification and work experience, number of pediatric patients treated, most common antibiotic prescribed, duration and dosage, clinical conditions for which antibiotics were prescribed, awareness about antibiotic prophylaxis, and awareness about antibiotic resistance. The data obtained were compiled, tabulated, and subjected to statistical analysis. The R software version 3.1.1 (GNU General Public License) was used for computing. For the comparison of prescription pattern between BDS and Master of Dental Surgery (MDS) practitioners, the chi-square test was used. The responses given by the participants regarding antibiotic prescriptions for commonly encountered oral conditions are compiled and presented in [Table 2]. 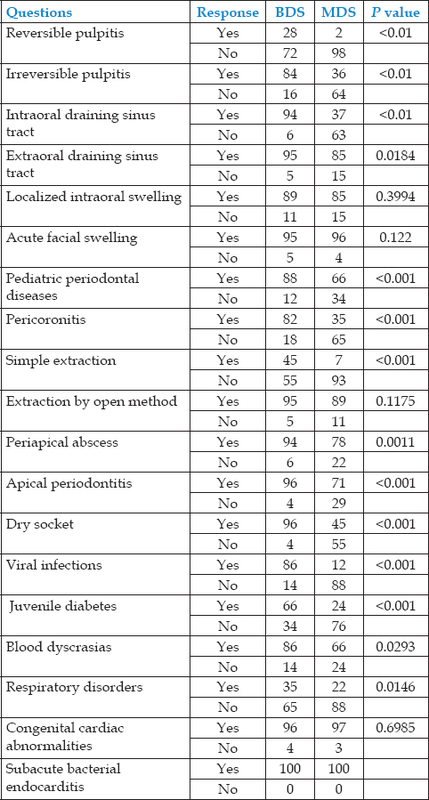 When comparisons were made between BDS practitioners and pediatric dentists, it was found that there was a significant increase in the prescription of antibiotics among the BDS practitioners than the pediatric dentists (MDS) for most of the oral conditions except for a few conditions such as localized intra oral swelling (P = 0. 3994), acute facial swelling (P = 0. 122), extraction by open method (P = 0. 1175), and congenital cardiac abnormalities (P = 0. 6985), which were not statistically significant according to the chi-square test. For the management of oral conditions, it was found that the majority of dentists prescribed amoxicillin (86% BDS and 70% MDS) as their first choice followed by ofloxacin with ornidazole (6% BDS and 13% MDS), cephalexin (2% BDS and 12% MDS), and clindamycin (6% BDS and 5% MDS) [Table 3] (a). In the presence of an anaerobic infection, the most common antibiotics prescribed were amoxicillin and clavulanic acid with metronidazole (97% BDS and 90% MDS); cephalexin was the next preferred choice (2% BDS and 6% MDS) followed by ofloxacin with ornidazole (1% BDS and 4% MDS) as given in [Table 3]b. 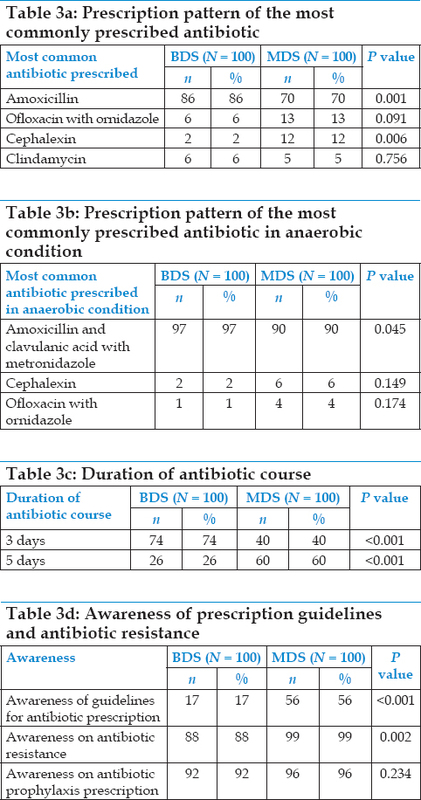 With regard to the duration of antibiotic prescription 74% BDS practitioners prescribed for 3 days, whereas 40% pediatric dentists prescribed for 3 days, which was statistically significant given as in [Table 3]c. In situations of an oral facial infection, the majority of the pediatric dentists (90%) performed incision and drainage followed by antibiotic coverage in contrast to only 22% BDS practitioners. With respect to the awareness of the guidelines for antibiotic prescription, only 17% BDS practitioners were aware as compared to 56% pediatric dentists, which was statistically significant given in [Table 3]d. Around 88% BDS practitioners and 99% pediatric dentists were aware of "antibiotic resistance" and a majority of them knew that self-medication and injudicious use of antibiotics were contributing to the development of antibiotic resistance. The knowledge of dentists regarding the prescription of antibiotics varied as shown in various studies. In studies conducted in England, Kuwait, and Turkey, it was found that many of the dentists prescribed antibiotics for dry socket which is not indicated as per the AAPD guidelines. Antibiotics were also prescribed for localized intraoral swelling in many studies conducted in Kuwait,  Norway,  England,  and South Australia  which is not warranted. Both these conditions are not indicated for antibiotic prescription as per the AAPD guidelines. In our study, 96% and 45% of the BDS and MDS practitioners, respectively, prescribed antibiotics for dry socket, which is not indicated as per the guidelines. The most commonly used antibiotic in dental practice is penicillin. The most popular antibiotic is amoxicillin followed by penicillin V, metronidazole, amoxicillin, and clavulanate. In our study, it was found that 86% of the BDS practitioners and 70% of the pediatric dentists relied on amoxicillin as the first choice, which was similar to studies conducted by Karibasappa,  Montgomery,  Gonul,  and Gregoire. In comparison between the two groups, it was found that there was a statistically significant difference in the prescription of amoxicillin and cephalexin with the latter being prescribed more by the pediatric dentists. In the presence of an anaerobic infection, the prescription pattern varied; 97% and 90% of the BDS practitioners and pediatric dentists, respectively, relied on the combination of amoxicillin and clavulanic acid with metronidazole. Similar findings were reported by Karibasappa  and Gonul. Cephalexin was the next choice (2% BDS and 6% MDS) followed by ofloxacin with ornidazole (1% BDS and 4% MDS). Results from a study by Karibasappa GN suggest that oflaxacin, ornidazole, and cephalexin were preferred after metronidazole. There was a statistical significant difference in the prescription of the combination of amoxicillin and clavulanic acid with metronidazole between the two groups. This could be attributed to the lesser exposure of BDS practitioners to the extensive literature regarding the newer antibiotics. The awareness of guidelines for prescription of antibiotics was found to be low among the BDS practitioners (17%) in contrast to the MDS practitioners (56%). The difference was statistically significant. The knowledge regarding antibiotic resistance was found to be adequate in the MDS group (99%). However, it was 88% in the BDS group showing a statistically significant difference. Another alarming finding was that 68% of the BDS practitioners prescribed antibiotics until the required speciality treatment could be rendered. 34% of the MDS practitioners prescribed antibiotics to postpone appointments. About 35% of the BDS practitioners prescribed antibiotics on the coercion of parents, which was irrational and also contributed to the antibiotic resistance. Despite the awareness of antibiotic resistance, dentists show a lack of concern in curbing this grave problem. The development of infective endocarditis does not require a prior intervention of any form, dental or nondental. The effectiveness of prescribing antibiotics prophylactically has not been proven clinically. Antibiotics when prescribed prophylactically prior to dental procedure present a greater risk of death through anaphylaxis than a protocol of no antibiotic prescription. The daily act of toothbrushing itself presents as a risk of infective endocarditis. However, in our study, it was found that 92% of the BDS practitioners and 96% in the pediatric dentist group were aware of the prophylactic regimen. Our survey findings suggest that antibiotics were prescribed indiscriminately, inappropriately, and injudiciously to manage the oral diseases. In our study, for many oral conditions, there was an overprescription in the BDS practitioners' group when compared to the pediatric dentists' group. This may have probably been due to inadequate understanding of the disease, less skill, and less competency in performing operative intervention measures. It has to be understood that dental diseases are predominantly because of local factors; the mere removal of the local causative factors reduces the need for prescribing antibiotics considerably. Antibiotics should be used only as adjuncts even when there is a real need and never as first-line treatment modality. In conclusion, the prescribing practices of dentists can be improved by increasing awareness of the recommended guidelines among dental practitioners. Furthermore, the importance of initiating awareness programs among the general public should not be overlooked. Also, emphasis should be laid on forming Indian guidelines for the prescription of antibiotics. Cleveland JI, Kohn WC. Antimicrobial resistance and dental care: A CDC perspective. Dent Abstr 1998;108-10. American Academy of Pediatric Dentistry Council on Clinical Affairs. Guidelines on use of antibiotic therapy for pediatric dental patients. Reference Manual 2013-2014. Pediatr Dent 2013;35:546-9. Oberoi SS, Dhingra C, Sharma G, Sardana D. Antibiotics in dental practice: How justified are we. Int Dent J 2015;65:4-10. Khan K, Muennig P, Behta M, Zivin JG. Global drug-resistance patterns and the management of latent tuberculosis infection in immigrants to the United States. N Engl J Med 2002;347:1850-9. Musoke RN, Revathi G. Emergence of multidrug-resistant gram-negative organisms in a neonatal unit and the therapeutic implications. J Trop Pediatr 2000;46:86-91. Karibasappa GN, Sujatha A. Antibiotic resistance-a concern for dentists? IOSR-JDMS 2013;13:112-8. Longman LP, Preston AJ, Martin MV, Wilson NH. Endodontics in the adult patient: The role of antibiotics. J Dent 2000;28:539-48. Salako NO, Rotimi VO, Adib SM, Al-Mutawa S. Pattern of antibiotic prescription in the management of oral diseases among dentists in Kuwait. J Dent 2004;32:503-9. Addy M, Martin MV. Systemic antimicrobials in the treatment of chronic periodontal diseases: A dilemma. Oral Dis 2003;9(Suppl 1):38-44. Palmer NO, Martin MV, Pealing R, Ireland RS. An analysis of antibiotic prescriptions from general dental practitioners in England. J Antimicrob Chemother 2000;46:1033-5. Ocek Z, Sahin H, Baksi G, Apaydin S. Development of a rational antibiotic usage course for dentists. Eur J Dent Educ 2008;12:41-7. Jaunay T, Sambrook P, Goss A. Antibiotic prescribing practices by South Australian general dental practitioners. Aust Dent J 2000;45:179-86; quiz 214. Palmer NO, Martin MV, Pealing R, Ireland RS, Roy K, Smith A, et al. Antibiotic prescribing knowledge of National Health Service general dental practitioners in England and Scotland. J Antimicrob Chemother 2001;47:233-7. Demirbas F, Gjermo PE, Preus HR. Antibiotic prescribing practices among Norwegian dentists. Acta Odontol Scand 2006;64:355-9. Al-Haroni M, Skaug N. Knowledge of prescribing antimicrobials among Yemeni general dentists. Acta Odontol Scand 2006;64:274-80. Yingling NM, Byrne BE, Hartwell GR. Antibiotic use by members of the American Association of Endodontists in the year 2000: Report of a national survey. J Endod 2002; 28: 396-404. Rodriguez-Núñez A, Cisneros-Cabello R, Velasco-Ortega E, Llamas-Carreras JM, Tórres-Lagares D, Segura-Egea JJ. Antibiotic use by members of the Spanish Endodontic Society. J Endod 2009;35:1198-203. Mainjot A, D′Hoore W, Vanheusden A, Van Nieuwenhuysen JP. Antibiotic prescribing in dental practice in Belgium. Int Endod J 2009;42:1112-7. Peedikayil FC. Antibiotics: Use and misuse in pediatric dentistry. J Indian Soc Pedod Prev Dent 2011;29:282-7. Swift JQ, Gulden WS. Antibiotic therapy-managing odontogenic infections. Dent Clin North Am 2002;46:623-33, vii. Poveda Roda R, Bagan JV, Sanchis Bielsa JM, Carbonell Pastor E. Antibiotic use in dental practice. A review. Med Oral Patol Oral Cir Bucal 2007;12:E186-92. Montgomery EH, Kroeger DC. Use of antibiotics in dental practice. Dent Clin North Am 1984;28:433-53. Gonul O, Aktop S, Satilmis T, Garip H, Goker K. In: Motamedi MH, editor. Odontogenic infections. A Textbook of Advanced Oral and Maxillofacial Surgery. Turkey: InTech; 2013. Gregoire C. How are odontogenic infections best managed? J Can Dent Assoc 2010;76:114-6. Charney E, Bynum R, Eldredge D, Frank D, MacWhinney JB, McNabb N, et al. How well do patients take oral penicillin? A collaborative study in private practice. Pediatrics 1967;40: 188-95. British Dental Association; British Medical Association and Royal Pharmaceutical Society of Great Britain. Dental Practitioner′s Formulary. London, UK: British Medical Association and the Royal Pharmaceutical Society of Great Britain; 2006. Rubinstein E. Short antibiotic treatment courses or how short is short? Int J Antimicrob Agents 2007;30(Suppl 1): S76-9. Pallasch TJ. Antibiotic resistance. Dent Clin North Am 2003; 47:623-39. Thomas DW, Hill CM. An audit of antibiotic prescribing in third molar surgery. Br J Oral Maxillofac Surg 1997;35:126-8. Kaczmarzyk T, Wichlinski J, Stypulkowska J, Zaleska M, Panas M, Woron J. Single-dose and multi-dose clindamycin therapy fails to demonstrate efficacy in preventing infectious and inflammatory complications in third molar surgery. Int J Oral Maxillofac Surg 2007;36:417-22. Gould FK, Elliott TS, Foweraker J, Fulford M, Perry JD, Roberts GJ, et al. ; Working Party of the British Society for Antimicrobial Chemotherapy. Guidelines for the prevention of endocarditis: Report of the Working Party of the British Society for Antimicrobial Chemotherapy. J Antimicrob Chemother 2006;57:1035-42. Wilson W, Taubert KA, Gewitz M, Lockhart PB, Baddour MM, Levison M, et al. ; American Heart Association Rheumatic Fever, Endocarditis, and Kawasaki Disease Committee; American Heart Association Council on Cardiovascular Disease in the Young; American Heart Association Council on Clinical Cardiology; American Heart Association Council on Cardiovascular Surgery and Anesthesia; Quality of Care and Outcomes Research Interdisciplinary Working Group. Prevention of infective endocarditis: Guidelines from the American Heart Association: A guideline from the American Heart Association Rheumatic Fever, Endocarditis, and Kawasaki Disease Committee, Council on Cardiovascular Disease in the Young, and the Council on Clinical Cardiology, Council on Cardiovascular Surgery and Anesthesia, and the Quality of Care and Outcomes Research Interdisciplinary Working Group. Circulation 2007;116:1736-54. NICE. Prophylaxis Against Infective Endocarditis: Antimicrobial Prophylaxis Against Infective Endocarditis in Adults and Children Undergoing Interventional Procedures. Nice Clinical Guidelines No. 64. London: National Institute for Health and Clinical Excellence; 2008.